Jimmy https://jimmy4unc.wordpress.com Husband. Father. Pastor. Friend. Follower of Jesus. Everything else is gravy. Recently a Greenville, South Carolina pastor gave his wife a gift that caused quite a stir on the internet. Admittedly, it was a VERY nice gift – a new Lamborghini Urus (similar to the picture above). The car company describes it as a “Super Sport Utility Vehicle” a “super sports car soul and the functionality typical for an SUV.” The price tag is over $200,000 depending on how the car is equipped. Now, I don’t have time to do in-depth research on John Gray, but here is some information I discovered to provide some context. Gray is pastor of Relentless Church, a megachurch in Greenville. According to reports, 8,000 to 10,000 people attend Relentless each week. The church is multi-cultural in both its membership and its staff. Before starting Relentless, Gray served in various church roles to youth and young adults. He also served as an associate pastor to Joel Osteen at Lakewood Church in Houston. He and his wife have a TV show on Oprah Winfrey’s network that will be going into its fourth season. In addition, Gray has written two books and is working on a third. He has appeared on the Fox News segment called “The Preachers.” Pastor Gray met with President Donald Trump earlier this year to discuss prison reform, a decision for which he received harsh criticism from some. John Gray is not an obscure small town preacher. He is winsome, humorous, charismatic, intelligent, hard-working, and undoubtedly an effective communicator. He is not perfect. He’s made his share of mistakes, and readily admits it. Gray gives every indication of being a devoted husband and father. He also appears to genuinely care about people. I provide this background (brief as it is) to provide context and to show you that John Gray is an influential preacher and pastor who has drawn national attention for his work. My intent with this post is not to exonerate or condemn Pastor John Gray for giving his wife a car that costs four times the median American household income. Instead, I would like to provide some thoughts on this action from three perspectives – as a husband, as a Christian, and as a pastor. I watched Pastor Gray’s video explanation of his purchase. He made it clear (and there’s no reason to assume otherwise) that he did not spend any of the church’s funds to purchase the car. He also clarified that he did not buy the car outright but made a downpayment. His stated motivation was his love and devotion to his wife and his appreciation for her support and encouragement. He stated that he wanted to give her the very best he was able to give because she had given her best to him. So, as a husband, I do understand him wanting to bless his wife. I think most husbands look for ways they can express their love and appreciation to the woman they married. Okay, not everyone can afford to give so lavishly, but not every husband has extra income from a TV show or book sales to bolster his bottom line. Certainly, I cannot express my gratitude for my wife in the same way that John Gray did for his, but I do try to treat her as well as I can. Other Christian men are able to do more and better. Believe it or not, there’s not rulebook for this. So how much should I spend to show my devotion to my wife? If I took my wife out to a nice steak dinner, most people would understand. If I took her on a vacation to the beach, the mountains, the Caribbean, or even to Italy, again, most people would be okay with that. If I presented her with a new Kia, Toyota, or Buick, there may be some who judged me silently, but most would appreciate the gesture. Where is the line between an acceptable gift for one’s spouse and one that is over-the-top extravagant? Gray’s argument is that he gave the gift as a husband and not as a pastor. I have some empathy for that viewpoint, but the reality is more complex. I’ll address the pastor issue a bit more later in this post, but, for now, let me just say that in a perfect world spouses should be able to express their love for one another in tangible ways without criticism or condemnation. In the real world, however, giving expensive gifts to a wife or husband will inevitably generate envy in some, anger in others, and outrage in still others. In other words, giving expensive gifts to your spouse may come at a higher price that the one printed on the receipt. I asked previously where the line is between what is extravagant and what is acceptable when it comes to gifts from pastor to spouse. The truth is, the line is relative. Each Christian would likely draw it in a different place depending on their circumstances, their level of spiritual maturity, their personal experiences, and how they choose to live our their own lives as followers of Jesus. Here’s an experiment. As a Christian, if your pastor were to give his wife (or her husband, as the case may be) one of the following as a gift for their anniversary or as a birthday or Christmas present, where would you draw the line between acceptable and extravagant? Oven mitt – gold cross necklace – Apple iPad – oven – diamond earrings – Caribbean cruise – ski trip to Aspen – two-week trip to Europe – Honda Accord – remodeled kitchen or bathroom – both a remodeled kitchen and bathroom – Cadillac Escalade with all the bells and whistles – vacation home in the North Carolina mountains – Lamborghini Urus – waterfront vacation home at Panama City Beach. * Depending on who you are and what your circumstances and experiences are, you might draw the line after oven mitt, or you might argue that there should be no line at all. Let’s face it, we can be pretty good at making judgment calls in the lives of other believers. The fact that my wife and I just returned from attending a wedding in Puerto Rico having stayed in a nice hotel and eaten at pretty good restaurants may have caused some people to declare (at least inwardly) that we were extravagant, wasteful, and perhaps even insensitive toward those who could not afford such a trip. There are a lot of blessings in being a pastor, but sometimes it is a fishbowl existence. People may judge me as harshly for my decisions on spending as some judge John Gray or Joel Osteen or Joyce Meyer (fill in the blank with your favorite target). We will also have to give an answer before the Lord as to how we used the resources that He entrusted to us. From my perspective as a Christian, just one of the greater flock, Gray’s gift of a Lamborghini to his wife is a bit tough to swallow. Just because he can afford to give such a gift doesn’t mean it’s the wisest or best thing to do. As a Christian, I understand that pastors are viewed differently and, therefore, may face ridicule for the decisions they make about money and lots of other things. He cannot allow his life to be dictated by the critics, but he cannot brush aside all criticisms as if they have no merit. I haven’t read any of John Grays books, watched any of his TV shows, or listened to him preach, so I only have a small grasp of his view of prosperity and spending, but church members should expect their leaders to model good stewardship. Christians should also be careful not to become resentful or envious of others or that they do not become harshly judgmental toward another. Let’s not allow another’s visible extravagance to lead us into invisible (yet not less real) sin. Number 1 – I understand that I live in a fishbowl. My decisions and actions do have an impact on believers and non-believers. Although I cannot let my life be dictated by the opinions of others, I cannot be deaf toward those opinions or the potential fall out from my choices. Number 3 – As part of modeling the Christian life, people should be able to see that I love and appreciate my wife in my words and actions. The resources which God provides me are not only to be used to expand the Kingdom and help those in need; I am also expected to care for my family. I want to do the best for my children and my wife. What that best looks like will be different for each person. Number 4 – I have learned that not everything I do for my family is for public consumption. I do need to praise my wife and children publicly, but I may not want to post every gift I give them on Facebook or Instagram. A little wisdom in this area goes a long way. Number 5 – I will have to give an account to God. I am an owner of nothing but a steward of everything in my life. People have opinions, but ultimately the opinion that matters is God’s. That is true for me. It’s true for John Gray. It’s true for you. I’m not sure if this lengthy post helps anyone process the story of John Gray’s gift to his wife, but I somehow felt compelled to write it. Maybe it is just my own way of processing this unusual gift. I don’t want to sit in judgment on anyone, but I realize that his actions (and mine) will most certainly invite judgment. It’s inevitable in this world. So… let us be wise with our money. Let us be generous in our giving (money, gifts, and otherwise). Let us be faithful in our stewardship. Let us be gracious toward others, even if we do not agree with their decisions. And let us live in such a way that delights the heart of God and grows His Kingdom. We didn’t get any snow. It was plenty wet but not quite cold enough. Of course, as far as Sunday morning worship attendance is concerned, cold and wet is better than cold and snow. If we could just figure out how to make it snow on Sunday afternoon or evening and then through the day Monday. The weatherman didn’t promise snow for our area. He didn’t even hint that it might snow in Greene County, Georgia. The projection map showed snow in north Georgia, parts of South Carolina, and some pretty heavy snow in North Carolina. But when you live just below the blue coloring on the state map, you hold onto just a little hope that you might wake up in the morning to a gentle snow fall on an already white lawn. I’ve lived here long enough to learn to live with the disappointment… but I still peek through the blinds on those occasional mornings when snow is expected anywhere nearby. Hope… Sometimes our hope is based merely on wishing. The wishes, on rare occasion, may come true, but mostly that kind of hope is met with disappointment. There is a hope, however, that is based on something more true and trustworthy than merely wishing. We can put our hope in a God who is faithful to fulfill His promises. 36 And there was a prophetess, Anna, the daughter of Phanuel, of the tribe of Asher. She was advanced in years, having lived with her husband seven years from when she was a virgin, 37 and then as a widow until she was eighty-four. She did not depart from the temple, worshiping with fasting and prayer night and day. 38 And coming up at that very hour she began to give thanks to God and to speak of him to all who were waiting for the redemption of Jerusalem. For those who reside in middle and southern Georgia, the hope for snow often ends up as nothing more than gray skies and cold rain. But there is a hope that will not disappoint us. There are promises that are sure and certain. What an incredible promise! And the fulfillment was even more amazing! Christian hope is a confident assurance that what God has promised will surely come to pass. May your home and family be filled with the hope of Christmas this season. As we draw nearer to Christmas, it’s now time to enjoy the sounds of the season. Through the years, I have found some full albums that keep me coming back over and over again. I’m sure you have your favorites, too. Here is a Spotify playlist with some of the songs I have on repeat this season. Spotify is an online or app-based music service. There is a free version (with some commercial interruptions) and a paid version. 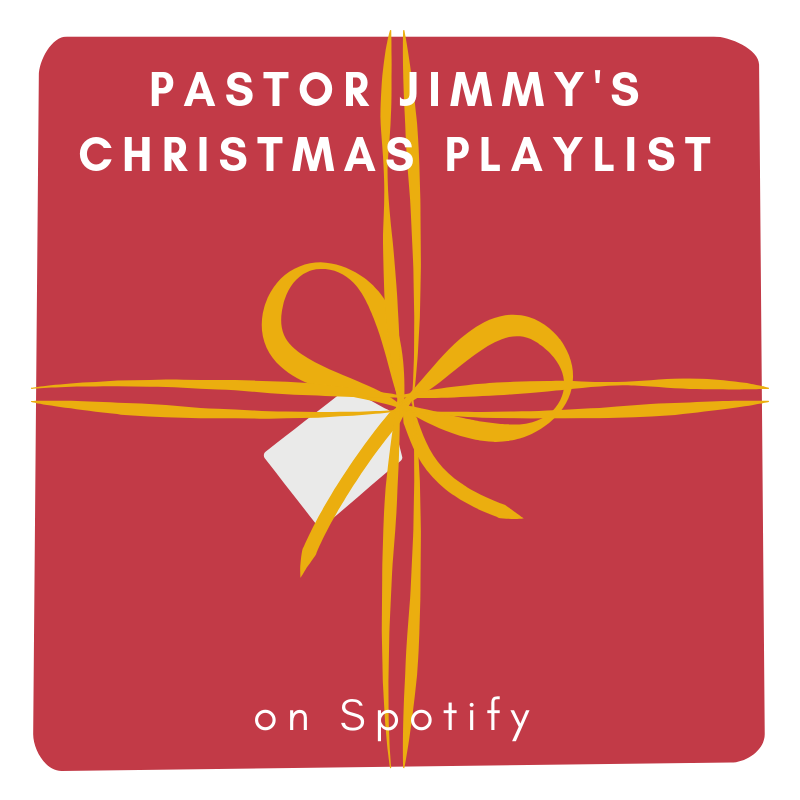 If you’re curious as to what I’m listening to in my office or as I drive around, here’s my 2018 Christmas playlist. It’s almost Christmas! It’s a wonderful time of year for many, but it can also be a time that puts a huge strain on your finances. We want to everything that our family and friends put on their wish lists- we may even feel compelled to do so – but doing so comes at a huge cost. A Gallup survey estimated that adults in the U.S. will spend about $885 on Christmas gifts this year. 33% expect to spend at least $1000 on gifts. And we need to keep in mind that actual spending tends to be higher than the forecasts. Holiday sales are expected to increase over 2017. Spending will likely exceed $700 billion. Another item worth noting is that many of the gifts that make it onto wish lists are bigger ticket items – smart phones, tablets, laptops, video games systems, etc. In our desire to give our families a merrier Christmas, we can get ourselves into some seriously bad financial situations – or we simply feel guilty because our kids can’t get the latest and greatest like all their classmates seem to have. It’s easy to fall into this trap, so you need a plan for safe spending this Christmas season. Here are a few tips to keep in mind. Set a budget. It sounds so easy, right? Even so, many people refuse to set a realistic spending budget for holiday gifts. They’d rather just go with the Christmas flow. Caution – Don’t begin with the wish list. Begin with a spending limit for each person. Set expectations. If money is tight this year, then tell your family so. Don’t pretend you’re better off than you actually are. Might your kids (or spouse) be disappointed? Sure…but you can’t let guilt be the driving factor in your finances. Be careful with credit cards. Credit offers a false sense of prosperity. You can get what you want now, but the bill comes due a bit later. The wise of use of credit can be a good thing, but too many get stuck with having to making minimum payments on credit cards and getting hammered by interest charges. Limit the amount you put on credit cards. Be careful about spending on yourself. I have to confess that this is one area where I struggle. When looking for gifts for others, I inevitably find stuff I want. After all, it’s on sale, I could really use it, and no one is likely to get it for me. This is especially true when I wander the aisles of stores like Home Depot or Lowes. Remember that you’re not in competition with other families. TV commercials make it seem like you should give our husband a pricey car with a big red bow or give your wife a sparkling diamond necklace. Somehow we have been convinced that our children are being deprived if they don’t have the latest iPhone or gaming system. The truth is, some families can afford a Christmas like that, but most can’t. Do the best you can with what you have, but don’t try to compete. Plan ahead for next year. This year is what it is, but to avoid getting caught in the same Christmas trap next year, begin planning early. Put a little money aside each month in an account just for Christmas. In fact, living on a budget in 2019 will help in a lot of areas. Growing up, the celebration of Advent wasn’t part of our Christmas experience. It was only when I started pastoring that I gained an appreciation of Advent – what it could mean in the church and what it could mean in the home. In a time when Christmas has been virtually stripped of its Christian meaning, it may be more important than ever to ground our celebration in the anticipation of Advent. Listen to sacred music. Admittedly, I’m not much on listening to Christmas music too early. Once past Thanksgiving, I’m ready to start listening in small doses. There is a lot of good music you can pick from. Some of it is secular (referring to Santa, Rudolph, Frosty, etc.) and some of it is sacred (focusing on the birth of Jesus). Make sure you and your children are getting a good dose of Christ-centered Christmas music. Since music tends to stick to the soul, this is a great way to make the story of Bethlehem stay with us during the season. Celebrate Advent at home. Along with putting up the tree, wreaths, candles, and other decorations, consider having a “countdown” to Christmas that is focus on the birth of Jesus (not just the arrival of Saint Nick). Our children grew up with an advent “calendar” where each day had a small pocket containing a puffy piece of a manger setting. Our kids alternated putting one in place piece each day (they stuck in place with velcro) until Jesus was put in the manger on Christmas day. There are lots of options, so find one that works for you. Read an Advent devotional. Advent devotionals can be found at online marketers and in Christian bookstores. You can also get them on your mobile device. In other words, they are easy to get your hands on and helpful to keep you centered on the meaning of Christmas. Many times, your home church will recommend or provide an advent devotional, so look for that. You can find an Advent devotional for singles, couples, children, families, students – the list is nearly endless! Make the manger central. Putting up the Christmas tree is usually the most time-consuming aspect of decorating. It is often the central focus of the room. Consider making the manger scene more central. Give it a higher priority in decorating. If you have children, let them help put the pieces into place. I have heard of families that wait to put baby Jesus in the manger until Christmas morning. You don’t have to be overly creative, just make the manger a bigger deal. Cook together. In a fast-food generation, think about how the kitchen can bring the family together. Many families make candy or cookies or bread together around the Christmas season. This can be a great opportunity for children and teens to help roll out dough or use the cookie cutters. Think about how you can use the cookie cutters to talk about Christmas. Consider taking the wait time while the goodies are in the oven to talk about waiting for Jesus. Think about your neighbors. What can you do to show the love of Jesus to your neighbors? You could bake cookies and take to them. You can rake the leaves of an elderly neighbor. You could volunteer to watch the neighbor’s children to allow them to go to dinner or do their Christmas shopping. You could make Christmas cards and walk through your neighborhood to deliver them. Whatever you do, use Christmas as an opportunity to show the love of Christ. Help the poor. If you have the ability, consider teaching your children the value of every person by finding a way to help those who have less. There are lots of charities that help, and you could certainly contribute to this. If you have children, let them know what you’re doing. If there is a way, let them participate – even if it is applying a stamp or sealing an envelope. You could pick up items at the grocery store for the local food pantry. You could donate coats to a coat drive. You could find a needy family to whom you could give food or gifts. The options are nearly limitless, just do it to show love in Jesus’ name. Tip well. Servers at restaurants work hard and often for lower pay. If you’re able, tip generously. If you have children, let them leave the tip and talk to them about giving to others in the same way that God gave to us. If you can, leave a handwritten note wishing you serve a Merry Christmas. Make an Advent prayer chain. With some construction paper, scissors, tape, and a maker, you can create a prayer chain to help you and your family more prayerful during December. Each day, think about who you can pray for and/or ask your children who they should pray for, then write that name on a strip of construction paper, pray together for that person or ministry, and tape the strip into a circle. Each day, add a new name and link it to the previous day. Consider finding a prominent place to display the chain as a reminder to pray. 17 years ago, the World Trade Center towers fell taking with it thousands of lives and dispelling the notion that America was safely at a distance from the reach of terrorists. 17 years ago, Americans sat in stunned silence watching those massive towers burn and fall, watching men and women desperately racing away from a wave of dust and debris racing down Lower Manhattan streets, watching brave men and women running toward danger in an attempt to save those that they could, watching with tears and a sense of helpless at the senseless evil unfolding live on our televisions. 17 years ago, people who had not prayed in years, in their helplessness, turned their eyes heavenward to God once again, all the while asking why that very same God might allow such horrific acts to happen. 17 years ago, those things which divided us momentarily disappeared as we were united in our horror at the devastation in New York, Washington, DC, and Pennsylvania, as we were united in our sorrow over the loss of so many men, women, and even children who believed it was just another day, and as we were united in our commitment to find and bring to justice those who committed these unimaginable acts of cruelty. 17 years ago, our world changed. Time has eased the pain, but it has not erased the memories. Life did not go back to normal, we simply learned to redefine normal. We added phrases like “war on terror” to our vocabularies, and from that point, kept adding phrases like “al Qaeda” and “ISIS” and “Boko Haran.” Countless people have died on both sides of this unholy war, and most of those have been noncombatants. Families in America, as in so many other nations, will have empty places at their dinner table because moms and dads went to fight this war and never came home. 17 years ago… it seems like yesterday, and yet it seems like a thousand years have passed. Today we remember. We stir up the embers of our grief. We say a prayer for those lost and those who still fight and those who suffer because the fighting still goes on. Perhaps we dig out that flag lapel pin or rehang that flag that has been unceremoniously folded in the back of the closet. It is not that we have forgotten – we cannot forget – it is that we have adjusted, adapted, found a way to live in this strange new world. But we do so with a haunting uneasiness.